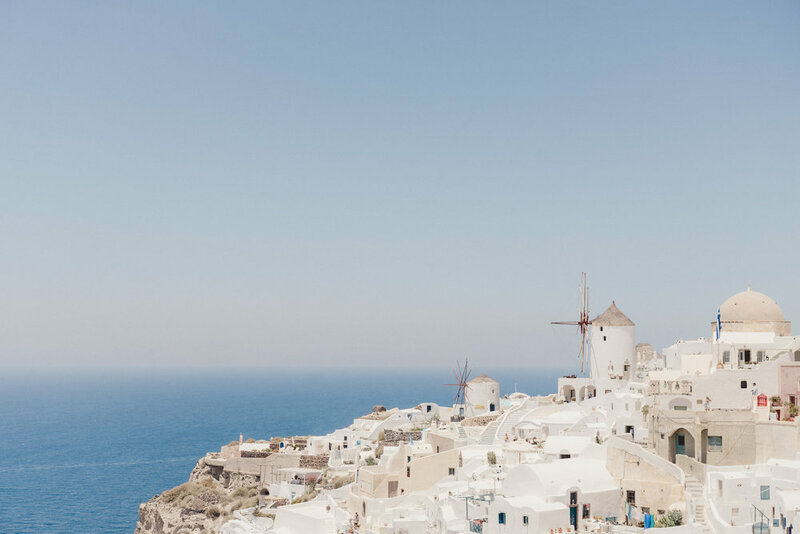 From the moment you arrive at the port or step off the airplane, Santorini welcomes you. A private van awaits to carry you up the steep cliffside from the ferry port, followed by a picturesque drive along the sea-side of the island. Staring off into the hazy sea quickly ushers you into dreamful awe. A sudden stop, a popped trunk, an eager gentlemen grabs your bags, and an usher greets you before guiding you through the Santorinian steps to your Greek oasis. Checking in is followed by a quick mimosa — or in our case, Greek iced tea — at which point another gentleman guides you to your room. From the ferry to your room’s front door — it’s all build up. Build up for what awaits on the other side of your hotel room’s shutters. It’s like the caldera is purposely hid from view as you ride to the hotel. It’s like the island’s beauty must be unwrapped like a Christmas gift. I’ve never seen something that can match its serenity. From the cliff, the caldera looks as though it can be picked up and held in the palm of your hand. The ripples of the sea wave in the Cycladic breeze, while small ferries usher visitors to and from massive Mediterranean cruise ships. It’s all right there, right in front of you. The most beautiful place on Planet Earth. I can’t help but recommend Imerovigli. 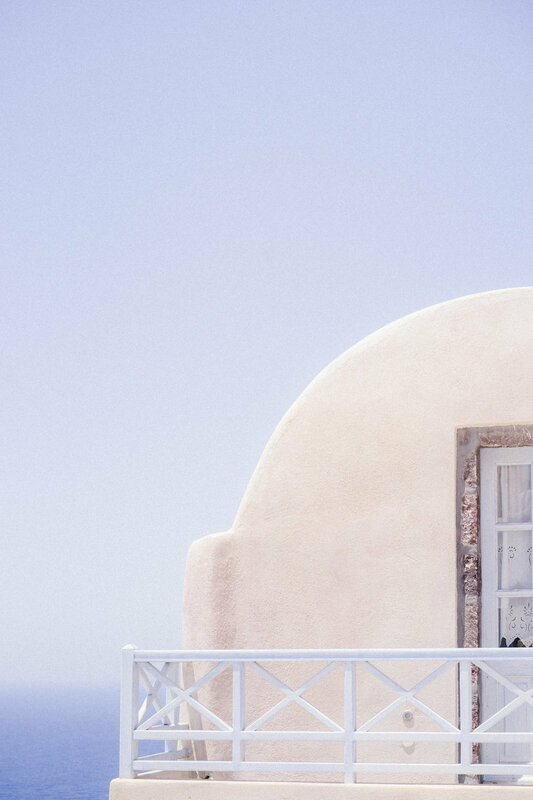 The main island of Santorini has a few towns, each with their own personality. Oia is the most popular and most touristy, and is home to the most incredible sunset on the planet. Fira has the most restaurants and some of the best nightlife on the island. Firostefani is quiet — we walked right throughgh it without even knowing it. And Imerovigli — not only is it quiet, it’s also situated as though it were hanging over top of the caldera. Santorini’s caldera view is best experienced in Imerovigli, while Santorini’s sunset view is best experienced in Oia. I say stay in Imerovigli, and take the bus to Oia for the sunset. Oia’s sunset is magical. But you can take it a step further by making the dungy walk down to Amoudi Bay and ordering a fresh fish at Katina’s. The fish on display are all caught the day of, are ordered right from the display, are cooked within minutes, and are served whole. You pay per fish, and one fish is more than enough to feed two people. We paid around 55€ for a simple sea bass cooked in oil, yet that fish may have been our favourite meal on the trip. Whatever is left over is fed to one of the stray cats wandering around. The sea food at Katina’s is fresh and delicious, of course. But Katina’s is located right on the water — a few tables will surely get a salty splash from time to time. These tables are the most coveted on the island — many couples are engaged at Katina’s under the gentle sunset. I can’t imagine a more scenic, romantic, and picturesque setting. Be sure to call ahead — or have your hotel call for you — to make a reservation. Assuming you stay for a few days and eat at Katina’s at least once, you should have a second or third sunset to take in with a glass of wine from your hotel balcony. Take a few sips of wine and breathe in the cooling air. Don’t blink. Don’t grab your camera. Hold your spouse’s hand. Smile. Watch the waves ripple and the tour boats float back and forth. Say “Wow” once or twice. Maybe eat some risotto if you haven’t had dinner. Comment on the vast elegance and beauty of the natural world. Close your eyes. Gently open them again. And treasure every moment of the setting sun as it floats behind the far off islands. That one magical sunset is worth every dollar. It can’t be taken away from you in that moment. It’s never-ending, yet gone in the blink of an eye. And it will call you in your photographs for the rest of your life. There is no more beautiful place on Planet Earth.